This Author has a way with describing scenes that is vivid and brings it all to life. She educates subtly in that she gives you the imagery from many parts of the world, the cultures, the habits, the different ways and more. I believe this is a new and particularly fresh way to educate. I compare her writing to the book Eat, Pray, Love. I hope this book becomes a movie too some day. Good luck and please write more! What an intriguing journey into Denise Kahn's metaphysical world! Her vivid tale of star-crossed lovers and love of life, music, and international adventure brings home a very important message ...love to the fullest with an open heart and never forget. You'll want to keep on reading after the last page...did not want it to end. This soul-searching story should be captured on the big screen with a sequel! What a thrill this novel is, especially for me, since I am Greek and a singer and have lived in many of the places in the book. It portrays beautifully the history of my country, some of which I lived through. Most of all, I truly love the way music is intertwined in the story. Musicians will not be able to put this book down, nor anyone else who appreciates a good novel. Please write more! This is an exquisite book. A beautifully woven tale covering several generations of one family whose paths are intertwined with an amazing Chinese vase. Although the story begins in China, the plot covers a range of countries and continents as well as several centuries as the magic of the vase touches the lives of the family to whom it belongs. The writing is beautiful, the characters are rich and varied and the pace changes from the smooth to the rough of World War. Be prepared to lose yourself in an amazing world of music, laughter and intrigue as you follow the vase from thirteenth century China to modern day Europe. This novel will not fail to capture the imagination of the reader. This tale is centred around a singing diva called Davina. From the first page the story whisks the reader along, from one crisis to another as we meet many other colourful characters along the way. This is very much an adventure story with love, deception and loyalty thrown into the mixture. The pace is quick as the action travels from country to country in a world of super stardom, yet very real human emotions. Hold onto your seats in this roller coaster of a journey! Thrilled this is a Trilogy! I just finished Denise Kahn's Obsession of the Heart...and was so sad that it was over as I turned the last page. I didn't want it to end and now with Warrior Music, I can continue reading this amazing story of the characters I have grown to love! I just ordered the soft cover edition...several for me, family and friends and started to read the e-book preview immediately because I cannot wait! It is such a beautiful gift...Kahn's talent. Written with heart and insight, she continues to weave this amazing tale of an incredible family. Her story lines are so well done...they hook you! 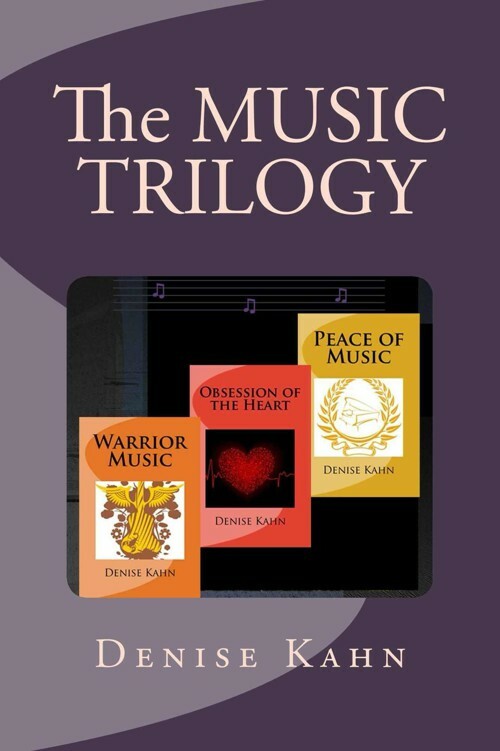 So excited to finish Warrior Music and can definitely see this trilogy on the big screen! Not just a book, but a journey. Once again Denise Kahn takes you from one corner of the earth to the other in this wonderfully composed novel. Her characters are so sincere, I feel that no matter who the reader may be a connection of some sort will be made. This is the gift of a special writer. Hopefully new books to come (fingers crossed)! "Take 80 inspirational quotes that will get you thinking about a variety of life's greatest truths, add in a wide array of stunning photos from every corner of the Globe and you have Denise Kahn's Around the World in 80 Quotes on Photos. The photos are as thought-provoking as the notable quotations - and add an element of beauty that only they can. If you wish to take an entertaining trip around the world without leaving your desk chair, this book will provide you with your round-trip ticket. I highly recommend this beautiful and stimulating book." And make our hearts smile. Who kept this history and tradition alive. The blind man looked up. He saw her. Oh, how vividly he saw her. The woman slowly extended her arm to him and smiled. A white aura enveloped her entire form and emanated from her heart like a bright sun. Her long white gown seemed translucent. She was surely the most beautiful of women, he marveled. Elegant and refined, sweet and delicate, her features chiseled as only the Great God could master. Yet her greatest assets were her compassion, mercy, and wisdom and of course, her power—more powerful than any other woman, man, or even Emperor. See-Fu was devoted to her. She guided him, and he followed her guidance. She was Quan Yin, his beloved Goddess. See-Fu was a short, thin man. His round face, adorned with a pencil-thin mustache drooping down the sides of his mouth, surrounded an easy smile. His eyes were an opaque blue, as if void of light, the areas around them pockmarked with tiny holes—the result of an explosion from his pottery oven that not only took the color from his eyes, but also left him blind and scarred. He was not badly disfigured, but had a rather haunting gaze. See-Fu sat cross-legged in front of his little altar in a small room surrounded by meticulously organized shelves lining the walls. Each shelf held glistening porcelain pots of different designs and colors, displayed by size. He knew exactly where each piece rested, each one lined up like a regiment of soldiers in perfect formation—from tiniest salt and pepper holders to large water urns. This was See-Fu’s porcelain shop. His fingers searched for an incense stick. He lit it, placed it in a holder in front of the sculpture of his goddess, touched her feet delicately, bowed in reverence and said a prayer. “Oh, Lady Quan Yin, you always come through for me. You always shower me with your abundant gifts of wisdom and love. I am truly grateful and honored. I am your humble servant,” See-Fu said, and bowed reverently. See-Fu reverently bowed again. He would do as she asked, even though he wasn’t really sure what she meant, but he trusted her implicitly. When he looked up Quan Yin was gone. “Father, Father, where are you?” A voice from outside called. See-Fu’s hands were close to his chest in prayer; his head bent forward almost touching the tips of his fingers. He had a smile on his face. Lotus Blossom walked in and saw her father sitting in front of the altar. She knelt next to him, hugged him and played with the ends of his mustache, almost tying them together, just as she had always done since she was child. He gently caressed her face, seeing her with his fingers. Lotus Blossom had her father’s jet-black hair. Her eyes were brown and soft, like a young doe’s. Her natural rose cheeks and lips, along with her very white complexion and flawless skin, made her the epitome of a china doll. Out of the corner of his eye he saw Quan Yin nodding. See-Fu sat on his doorstep as the sun came up over the horizon. He felt the warmth and smiled, partly because it would be a lovely sunny day, which he hoped would bring joy, and partly because he heard his beloved daughter. See-Fu gently held Lotus Blossom’s arm as she guided him into the fields. “Now, tell me what flowers you see,” See-Fu said. “Lovely. Pick some for me.” Lotus Blossom came back with several flowers. She handed them to her father. He smelled them. “Ah, these must be poppies, a beautiful red color. Good. Let’s continue.” See-Fu said, as he put them in a small leather pouch. They continued throughout the day. By dusk See-Fu’s collection included eleven different kinds of flowers, all meticulously kept in their individual little pouches. Back at the shop See-Fu selected thirteen tiny pots and lined them up on a work table. He removed the pouches from his belt and took out the flowers from the first one. He smelled them, tore off the petals, and placed them in the first little container. They were white daisies. He continued in the same fashion with all the flowers, sometimes rearranging the order of the pots after he had felt their texture or smelled them. One by one they filled up and See-Fu inhaled the rainbow of smells. The containers were arranged from light to dark: white, yellow, an empty one, pink, orange, light green, mauve, another empty one, blue, red, purple, and two more on each end without anything in them. They were there so that See-Fee would remember that the blank holders would be for the gold, silver, clear and black. He was finished and happy with the day’s work. In the background he heard Lotus Blossom playing her qin (pronounced chin), the seven string traditional zither. See-Fu went to his cot in the back of the shop and quickly fell asleep listening to his daughter’s music, the always-dangling mustache positioned straight across the smile on his lips. See-Fu and Lotus Blossom sat side by side on one of the steps in front of the door of their little house. The village was busy with the daily routine of merchants haggling, men and women buying supplies, little boys chasing little girls’ pigtails and dogs barking at the wheels of the carts rolling down the street. “You’re right! But how do you know?” She exclaimed. “Good day to you,” they answered. “See-Fu, I bring you only treasures today!” The merchant beamed proudly. See-Fu went closer to the cart. The stone merchant took See-Fu’s arm and guided him up and into the wagon. He felt around and touched several baskets filled with different colored stones and rocks. Lotus Blossom, having climbed in behind her father, picked up one of the bricks. “How are they made?” She asked. “That is a lot of hard work,” Lotus Blossom said. “So, tell me of your treasures, my friend,” See-Fu said to the merchant. “Oh, yes,” he answered. He turned to the merchant and said: “Now, I need something blue. “Father! We can’t afford all this,” Lotus blossom exclaimed. Her father was acting like an addicted gambler, she thought. “Just what are you up to, See-Fu?” The stone merchant asked. “You are a good man!” See-Fu said. Lotus Blossom stared at the two men, not daring to even speak. She trusted her father and hoped that he really did know what he was doing. She took all the stones that See-Fu had chosen, brought them into the house and put them on an empty table in her father’s pottery room. “I’ll take some of that too.” The two men settled their accounts and the merchant helped See-Fu off the cart. “I wish you and your daughter all the best, See-Fu. May she be as happy as she is beautiful,” the merchant said, waving. He was delighted with the day’s sales. He had made a handsome profit. As Lotus Blossom prepared lunch See-Fu carefully picked up each stone. They cost him almost all the money he had saved from when his daughter was born, in preparation for her dowry. Instead of money he now had minerals and his great faith in Quan Yin. See-Fu felt the stones one by one; the rough gold and silver nuggets, the one pockmarked with small rubies, the black coral from Australia, jade from Japan, carnelian from Ceylon, turquoise and lapis lazuli from the mountains of Afghanistan, and the different quartzes from the Urals: citrine, amethyst, clear, rose colored, milky and smoky. He had all the colors to match the petals in his little pots. That was how he would know the colors of the stones. He became acquainted with each piece. He closed his hand over them, one at a time, and realized that each one slightly vibrated and each one had its own rhythm. Some had slow pulses, others a little faster. He marveled at the beautiful secrets nature always lovingly divulged, delighted that these rhythms and vibrations would show him the colors of the stones. He no longer needed the petals. He didn’t mind the extra work that it had involved for he and Lotus Blossom had spent wonderful times together accumulating them. See-Fu immediately started his project. He took each stone and carefully hammered away until only the crystal remained. This took him days. Then one by one he placed each gem in a mortar and systematically crushed them until they became very fine powder. This backbreaking process took him months. Each time he finished he carefully put the powder in a small pot, similar to the ones that held the now dried flower petals. He lined the powders in the same way he lined up the colors. They stood in pairs; the petals in back, powders in front, and from light to dark. With each blow and turn of the pestle he saw his daughter’s happy face. See-Fu sat in front of the white porcelain vase. This process had been the easy part, having made many such vases with the pai-tun bricks. The challenge lay ahead. He washed his new creation with a large goat-hair brush until it was perfectly clean. He passed his fingers delicately over every inch. It was perfectly smooth, standing seven hands tall with a simple yet elegant design similar to an urn. See-Fu stretched out his arms and found both edges of the table. The vase was centered and now ready to be painted. In one corner towards the back, the little sculpture of Quan Yin seemed to stare at him. In the other back corner, an incense stick burned and the sweet smell enveloped him. His brushes, made by hand from horse, goat, and wolf’s hair, lay on one side of the vase. On another little table, by his side, were his small pots where the paints were ready and perfectly smooth. The colors were vibrant, each from a crystal or a precious stone, a gift from deep within Mother Earth. They waited, as if they had their own souls, for the paintbrushes to discover them. They, too, were on See-Fu’s quest. The village was dark and quiet, the majority of the inhabitants asleep. See-Fu sat motionless in front of his forum, his tools in precise formation, as only his mind could understand. He was meditating, analyzing how he should start. He just didn’t know how to proceed with his task—the one that would enable his daughter to become a happy bride. He just sat there, waiting, waiting. Nothing came to him. See-Fu focused his mind over each little pot. Even though he knew exactly where everything was he double-checked by passing his hand over each of the paints and felt each one’s distinct vibration. He took one of the goat-hair brushes and gently dipped the tip into one of the paints. He delicately held the vase with one hand and with the other he lifted the paintbrush, very much like a maestro waiting for his musicians. Then he applied the first brush stroke onto the white porcelain. Suddenly the baton with the goat-hair nib seemed to take on a life of its own, as if guided, and at the same time as if leading a great orchestra. See-Fu could hardly keep up, the pace was furious. As meticulously as he had prepared and arranged his paints, now he didn’t even have time to think as to where they were even placed. His hand dipped the different brushes into one paint, then the other and then another and another. He worked so fast that some of the paint stayed crusted on the vase, instead of being smooth and precise. This crusted paint would eventually turn into a novelty, and this enamel would become See-Fu’s trademark. He could feel his heart beating just like when he was a boy running through the woods, trying to get back home before the dark of night. He felt himself perspiring, and breathing hard. He tried to think of his next brush stroke, but it was futile. His hand worked faster than his brain, and he just let it happen. He was not one to interfere with divine intervention. The preparations had been painstakingly slow and difficult, but the painting of the vase was of lighting speed and finished by morning. See-Fu knew exactly when it was over, for the fury of the pace suddenly stopped, as did the music that played throughout the night (even though Lotus Blossom had long fallen asleep). He combed his hands over and above the vase leaving only a millimeter or air between his skin and the wet paint. His heart expanded with joy and pride. He lifted his head and saw Quan Yin smiling at him and then passed out at the foot of the table, his mustache making its own design on his face. When See-Fu woke up it was dusk. He had slept through the day and he almost jumped when he remembered the previous night’s furious events. He went to the vase and touched it with trembling hands. How did it turn out? Was it is a mess or was it superb? How could a blind man paint without seeing? And then he reprimanded himself and apologized to Quan Yin. He knew she had been with him all along. He ran his fingers over the finished vase and studied the design. From his touch he knew exactly what it looked like, and from the vibration of the minerals he understood what color the paint was. He lovingly, and with great delight, let his hands discover every millimeter of the vase. Fifteen months of work, an eternity of love, and one night went into his creation. He put his cheek on the vase and felt the tingling. He smiled. Yes, it was a success and he was indeed proud of his work. He mouthed a silent prayer to his Goddess. Quan Yin appeared from deep within the vase extending her hands toward him. See-Fu held his hands together in prayer close to his chest and bowed reverently. Quan Yin melted back into the vase. See-Fu stood before the temple of the Emperor of the Song Dynasty. He took a deep breath, knowing full well how much this audience would dictate the rest of his beloved daughter’s life. He walked up the steps of the palace, gently tapping the stone with his cane. He cradled the vase in its velvet sack very close to his heart, as if it were a baby. One of the Emperor’s guards escorted him to the main audience room, which was lavishly furnished with silk screens, cushions of all colors, and altars burning incense. He was guided to the middle of the gleaming polished wooden floor in front of a gilded throne. He thanked the guard and sat down, cross-legged. He carefully stood the vase next to him and waited. He was alone in the large room, his shallow breathing the only faint sound.See-Fu heard the shuffle of feet in the background. He knew it was the Emperor, followed by his entourage. He quickly knelt and bowed his head to the floor as the government representatives took their respective places behind their leader seated on a golden throne with great ceremony. The Emperor wore a robe made of pure gold silk and embroidered with exquisite colored designs. His head was covered with a round hat, very much like a crown, and his long thin mustache dangled down to his chest. His delegates hovered around him like bees. One of them whispered in his ear. The Emperor looked down at See-Fu. “So, it is See-Fu, the blind potter. What is it you wish?” The Emperor said, his voice booming throughout the large hall. “Ah, that is nice. And I presume you want something in return.” See-Fu was still on his knees, his head hovering just above the floor. “Look up, See-Fu… I mean, rise, rise.” See-Fu sat back onto his feet, his back very straight. He crossed his hands in prayer in front of his chest. See-Fu slowly and lovingly opened the sack. He removed the vase and then quickly held it over his head. The light coming in from the windows hit the vase. The effect was blinding. Everyone in the room gasped. Never had they seen anything so brilliant and divinely designed. They looked at it closely. The vase seemed wet, as if the paint hadn’t dried, or perhaps it was alive. On it, painted in brilliant green from the emeralds, were the fields of China with its people and myths, seemingly ready to jump out and speak. The Emperor was depicted, as well as the city and its inhabitants. In the background the countryside was filled with flowers, magnificent birds, and animals that seemed to sway, fly and run. Other people, in the fields and in the city, were talking, working, laughing and enjoying life in general. Above it all, in the dramatic blue of the lapis lazuli sky, an enormous majestic ruby-red and gold dragon enveloped the entire top part of the vase and seemed to come out of it. The Emperor and his officials were hypnotized and duly impressed. The piece was magnificent and unique. “It was quite simple really. I could see in my heart what I wanted to create and I thought of my daughter that I love so dearly. When I heard her play her qin my fingers became my eyes.” See-Fu could feel Quan Yin close by as he repeated some of her words. See-Fu paused for a moment, feeling the rise of his body’s temperature, unsure of the Emperor’s reaction. “It is Zhou… your nephew.” There, he had said it. The delegates gasped. Zhou was a noble, part of the Royal family, and a warrior. How could the Emperor grant such a wish? It was impossible. It was just not done. See-Fu was losing hope. The Emperor stood from his throne and walked around the large gold chair. He stopped and looked at the father begging for his daughter’s happiness. See-Fu raised his head a little. The delegates stared at the Emperor. He was pacing. They were worried. He was up to something. “Zhou has responsibilities. He is one of my military attachés. He does need a wife, but she must be of royal bearing.” He continued to pace. See-Fu said a quick prayer to Quan Yin. Something had to happen, it was now or never. “Bring me Zhou!” The Emperor shouted, making everyone present jump. One of the guards ran out of the hall. The Emperor sat back on his throne. The delegates whispered among themselves. Just what was the Emperor up to? A little while later the guard ran up to the Emperor, knelt in front of him reverently and whispered something. The Emperor nodded. The guard quickly rushed to the door. He returned with a handsome young man in full military regalia who immediately bowed in front of the Emperor. Zhou saw See-Fu and felt his mouth go dry. Why was he here, kneeling in front of his uncle, the Emperor? “Do you not realize that you have put yourself in a very difficult situation?” The Emperor’s voice seemed to grow an octave louder with every question. “I do.” Zhou still did not dare raise his eyes. “Do you not realize that you have spoken as only a man in love can?” The Emperor said, now just barely a whisper. Zhou nodded. “Do you not realize that I have but one alternative?” Zhou didn’t answer. He just looked pleadingly at his uncle. “He is going to execute him,” one of the delegates whispered to another. “No, he is a pacifist and a romantic,” another whispered back. “So he can keep an eye on him, like he does everybody else,” one of the delegates whispered. “Your wisdom is greater than even that of Confucius, my Lord,” Zhou said. “Thank you, Zhou. Now go take your future father-in-law to your future bride. She must prepare for the wedding. Women are very peculiar about these things.” The Emperor winked at his nephew. Zhou smiled at his uncle—a smile of gratitude and respect, and only the way a man in love could. He gently put See-Fu’s arm over his and the two men regally walked out of the room. See-Fu and Zhou arrived at the shop very quickly. “Lotus Blossom! Lotus Blossom!” They shouted.